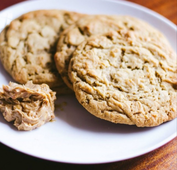 "Next time the sun has set and you have the craving for fresh baked cookies, don’t hesitate to pick up your smart phone or walk over to Red Eye Cookie Co. to get your cookie fix." 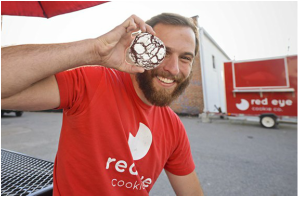 Episode 4 – Red Eye Cookie Co.
"I wish this was a thing when I was in school!" On a run with Red Eye Cookie Co.
"The topper on our roof read “Red Eye Cookie Co” and we were whizzing through the river city at 11p.m. on a Friday night to deliver gourmet cookies." "Two companies will battle for late-night delivery business"
"Red Eye Cookie Company opened last week on VCU’s campus, fulfilling the dreams of starving students and foodies across Richmond." "The wait is over, Richmond - Red Eye Cookie Company is opened Wednesday night - and it looks like Richmond loves its cookies." 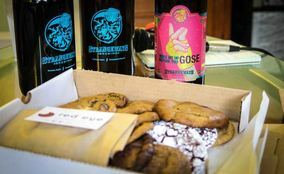 "Don’t blink, don’t rub your eyes, this is not a dream — Richmond now has its very own cookie delivery company." "Nothing says "this life is worth living" like fresh hot cookies delivered late at night." "...if you have a craving for something sweet late at night you can order cookies and have them delivered to you."